The Toyota Camry has been the best selling car in America for the past 15 years. Some may say “why risk significant changes to something that has been that successful?” I am not one of that “some.” I love that the company went back to the drawing board with a completely new design, new performance, new technology and a myriad of completely new features. The population at large will get to test drive and bring a new Camry home from their local Toyota dealership this July. I was among the few lucky enough to experience it in early June. 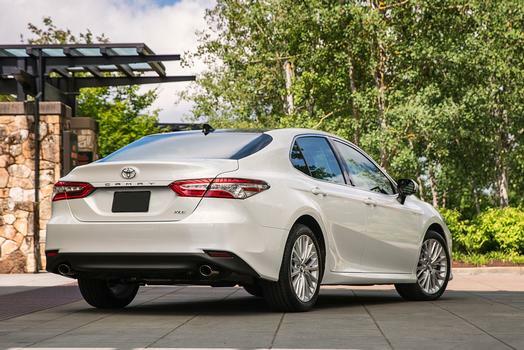 This new 2018 Toyota Camry has evolved a great deal. Its transformed from being a boring but completely and almost forever dependable motor car into being a boldly designed, totally evolved example of dynamics at work in its new eighth generation. Toyota points to the changes as being part of the company’s Toyota New Global Architecture (TNGA). The company relates that this is a new strategy that will encompass the way Toyota designs, engineers and packages its vehicles in the future. They pledge that the quality, safety and reliability that has allowed the company to be a world leader will remain but a new fun driving experience will be injected into the mix. I spent two days driving the 2018 Camry through the mountains northwest of Portland, Oregon as well as taking it onto the freeway leading southward toward Salem. I found the new Camry exciting to drive, very fuel-efficient, very comfortable and – as already acclaimed – very stylish. We turned more than a few heads, as myself and my drive partner Wayne Gerdes, stopped for photos many places along the way. We found the Toyota mileage claims and the EPA data supplied were right on target, if not a bit on the conservative side. Toyota provided us with a 26 mpg overall (22 city and 33 hwy) for the large-engine V-6 3.5 liter model. The 2.5 liter V-4 was estimated by the EPA to be at 29 mpg city/41 mpg highway and 34 mpg overall. The hybrid model shows 51 city/53 highway and 52 mpg combined. Wayne did extensive real-world testing within the time constraints needed. The third choice is the most-efficient-ever next-generation Toyota Hybrid System. The hybrid system is mated with a continuously variable transmission (CVT). Under most conditions, the CVT is my least favored type of transmission because of the constant “whining sound” most seem to make. Driving the new hybrid Camry, I did not even know I was “not” being shuffled through the gears. Somehow, Toyota managed to mimic a six-speed automatic if one used the paddle shifters. I have to admit the CVT completely fooled me since I never used the paddle shifters and it seemed as if my hybrid was marching through the gears like any “normal” transmission would do. Score another one for Toyota engineers! 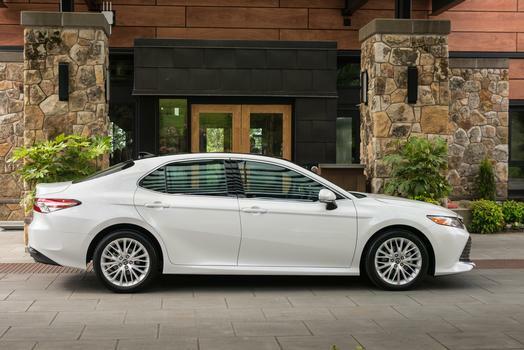 The new Camry is outfitted with Toyota Safety Sense standard. Safety Sense is a suite of cutting edge safety technologies to help toward achieving a goal of zero casualties from accidents. Safety Sense includes, Pre-Collision, Pedestrian Detection, Dynamic Radar Cruise Control, Lane Departure Alert, Steering Assist, and Automatic High Beams. Some model include as standard Blind Spot Monitor and Rear Cross Traffic Alert. Pricing for the new eighth generation Camry starts at $23,495 for the L model and marches up to $29,000 for the XSE. Hybrid models range from $27,800 to $32,250. This is not the Camry your parents drove. This is a car that has come light years from the days of its first introduction as a United States built car in 1989. It is worth drive to your local Toyota dealer just to check out the difference. See you in mid-July! 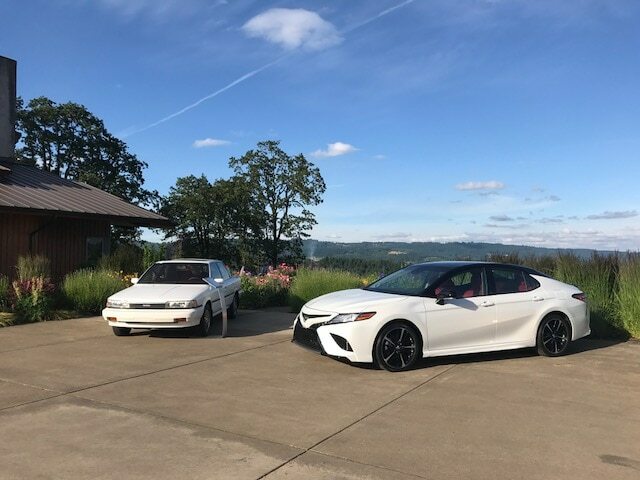 We were treated to a side by side view of the first Camry produced in the United States in 1989 next to the new 2018 Camry. Light Years of Advances. An understatement to be sure!